ElectraLink is answering industry’s call for innovation and transforming the Data Transfer Service (DTS) into the Energy Market Data Hub (EMDH) with additional services for users to make use of our data lake and transform the way they consume industry data. For over 20 years ElectraLink has supported the evolution of the UK energy market with consistent and reliable delivery of the Data Transfer Service. 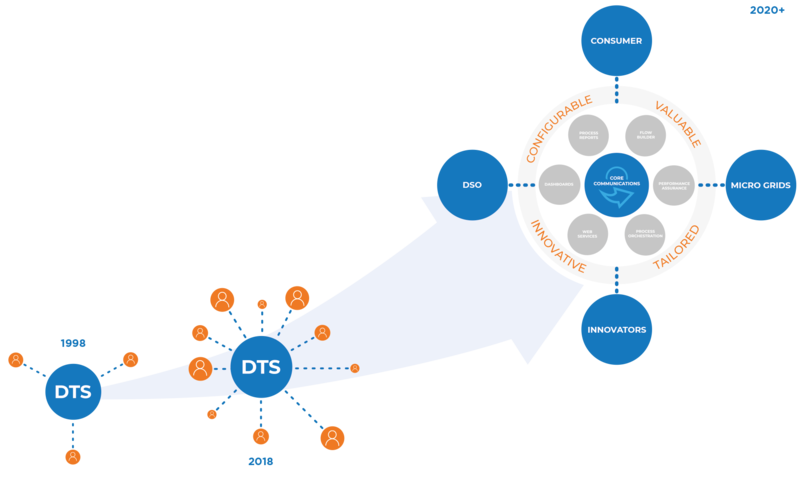 From its inception in 1998, the DTS has underpinned competition and growth in the market through flexible, secure and trusted data transfer. Always staying ahead of the technology curve, the DTS has adopted virtual private cloud technology and open source platforms in 2013 to ensure it can support dramatic growth whilst reducing costs to industry. The energy market is continually changing and the reliable and timely sharing of data is now vital to commercial success. At Electralink, we are ensuring that our customers can continue to succeed in the future by developing the Energy Market Data Hub (EMDH). The EMDH will continue provide the service that our clients rely on today and deliver the applications and services that they will need tomorrow. The EMDH is not simply a data transfer network. It will enable real time access to industry data at the centre of the industry, providing our customers with data, functions and insights that they need to improve consumer outcomes and differentiate their business in an environment of rapid change. Trusted, secure connections for 265 industry parties covering Suppliers, DNO’s, Agents and central bodies. Electralink has a unique opportunity to re-engineer the DTS to support the needs of the energy market for the next 20 years. Our vision is the Energy Market Data Hub. EMDH. A Platform for Innovation: Leveraging modern cloud based services the EMDH will be a scalable, flexible platform to provide the services, data and insights our customers need when they need them. Innovators will be able to use the EMDH as a platform for innovation. transfer, as well as reports to ensure secure industry communication. Fit for the Future: The EMDH will provide dashboards, critical operational reports and additional data access functionality including web services. Designed for Security: Central to the design of EMDH will be a service that is secure ensuring appropriate access control protection of industry data. Tailored: The EMDH will be configurable. Our customers will be able to tailor the platform to operate in ways that best suits their business. Integrated: The EMDH will be the platform for the continued integration of new actors into the market. It will also be a facilitator of new partnerships, allowing participants to connect in new ways using the EMDH. Reduced Cost to Serve – The EMDH will ensure that our customers’ key processes are efficient and effective, and based on tested, reusable products. Increased Customer Satisfaction – By using the data and communication services offered by EMDH our customers will be able to rapidly provide new and attractive value propositions including increased digitisation. Increased Collaboration – The EMDH will ensure that our customers can collaborate and co-operate in the most effective way possible and be a platform for increased market participation. Increase Product Innovation – The EMDH will ensure that our customers can tailor key processes, functions and reports in ways that are most valuable for them. We will provide integration as a service. Market Transformation – The EMDH will support the transformation of our customers’ businesses as we move into the smart energy future. Our re-procurmrent and design phase includes a continuous programme of industry engagement in order to gather rich feedback from across all stakeholders. If you would like to learn more about the design and applications currently under way, please contact our Director of Data and Transformation, Dan Hopkinson by emailing dan.hopkinson@electralink.co.uk.